Sarwat Chadda's Blog: Ever wanted to be a princess? I know I have. I belong to the Greenhouse Literary Agency. It's a bit like being back at school. Remember all those anxieties about not being cool, or popular, not too bright or sporty or having the wrong shoes and fearing you'll never, ever get to first base with anyone when the rest of the school's population were running victory laps around the park? Being a writer is a LOT like that, all over again. The agency is like the class. There are some who are cool. Others who are bright. Athletic. Popular. Not so bright. Spotty. Will get their lunch money stolen at the school gates by the teachers. So, where is this leading, you may wonder? If Harriet is the clever one, John is the one chained up at the back of the class and I'm the one without any lunch money, well Lindsey is the popular one. The glamorous one. The one every one can't help but want to hang out with. I feel pretty warm inside being able to tell people I know her, really, I do. And to prove it she's kindly - as well as saving me from a decade of solitray confinement and communal showers with large, hairy men - answered a few questions about her book, Princess For Hire. Princess for Hire is about Desi, a young girl who dreams of a better life, then gets it. And nothing goes to plan. She becomes a princess, for hire. Filling in for real royalty when the going gets too tough for them. It includes alien encounters, ritual mating dances in the Amazon, political upheaval and magic compacts. All the ingredients for a thrilling boys' own adventure! It is utterly hysterical. Read it. It'll make you a better human being. But enough about the book, what about Lins? I sent her a choice range of questions, none of that 'why did you want to be a writer' or 'who are your inspirations' stuff, but the real nitty-gritty. Sarwat: Pop quiz: You’re on a lifeboat and there’s just enough room (beside yourself and your Louis Vuitton monogrammed luggage) to save one person from the freezing sea out of: Christian Bale, Daniel Craig, or Taylor Lautner in a sort of survival of the abdominals type of thing. Who and why? Lindsey: Oh, there are some land mines in this question. I know who you want me to say. I think we ALL know who you want me to say, Sarwat. But I'm going to have to (pardon the expression) jump ship on this one and go with... Taylor Lautner. Sarwat says nothing but goes to his homemade shrine to Christian Bale and prays for Lindsey's soul. Sarwat (having now recovered from the shock of anyone picking anybody over CB): Glamour. Tiaras. Pink. Audrey Hepburn. Hannibal Lecter. Which is the odd one out? Lindsey: Audrey. The rest are things that consume you. Sarwat: Given all the trouble you went through to rid yourselves of England and its royal family, any regrets, now you’re a republic? Lindsey: Well, I think we can all agree that our accents are plain lame. And it's stupid that we've dropped all these letters as a way to establish this borrowed language as our own (honor? WE TOOK THE YOU OUT OF HONOUR). But had we stayed, we'd probably still be eating blood pudding, and I for one much prefer the preservative, sodium, fat-riddled food of the ol' U S of A. S: While on the subject of royal families, any truth behind the rumours regarding you and Prince Harry? L: How did you know I prefer Harry? I love when his face breaks into a smile. That fiery hair. His warmth. His... Wait. No comment. S: Catwoman. Dorothy Gale. Desi. The Bride of Frankenstein. These are all major literary feminist icons. How does it feel to have your creation up there amongst them? Any inspirations you’d like to share? L: I'm having a hard time wrapping my head around this compliment. I'm honoUred. To truly delve into Desi's psyche, I spent years studying feminist theory, paying particular attention to Margaret Mead's findings on cultural traditions in the south pacific. That, or I read my thirteen-year-old journal a bunch. One or the other. S: You bump into Steven Spielberg at the checkout. How’d you pitch P4H? You’re allowed props, but they must be readily available at your local supermarket. 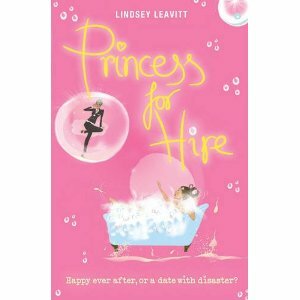 L: P4H is about a girl (point to self) who gets a job (point to cashier) working as a substitute princess (point to tabloid featuring Prince Harry and his scandals with beautiful, young author Lindsey Leavitt). Sorry, I'm not even good at charades. Throw in props and it'd be a total fail. Steve would likely suffer a concussion via pineapple. Buy Princess for Hire. You''ll thank me later. *Okay, not completely true, but very true-ish. Hey what d'you mean I'm the one chained up at the back of the clas??? Just wait till I get free! Oh dear. I sob at the state of the world if such things as these come to pass. Surely it is the sign of the apocalpse? Don't you realise CB is our only hope, John Connor? Check the initials, people! They let you out near a computer again? How many times do I tell them not to! Um, this is hilarious. I was the weird, quirky girl who wore yellow rain boots in dry-as-my-dating-life Vegas. So glad I have you fooled, Mr. C.
What? Yellow wellies are the height of fashion!